Grant Sheds is currently owned by Alison & Danny Halupka, but the Grant Sheds story started way back in 1952 when Ali’s dad, Grant Telfer, started the company. 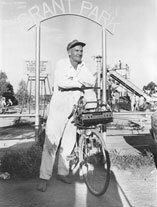 You might not know his name, but most people do remember the 5-acre Monash Adventure Playground he built here in Monash SA (here’s an older picture I found). So many families had fun on the 200-plus pieces of playground equipment he added over the years. It was free to enter all day, every day and had slides (including 3 that were on a 45’ tower, spiral slides, helter skelters, etc); more than 30 types of seesaws, flying foxes and even basic roller-coasters. It attracted more than 300,000 people a year from right across SA, interstate and even from overseas. Sadly it had to close in the early 1990’s because insurance companies would no longer insure it. 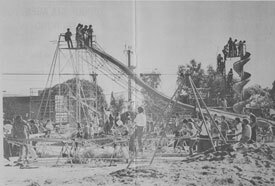 That was the start of the ‘litigation era’ and insurance companies saw playgrounds as high risk … Or was it just that too many people were having too much fun for free ?!? I’m also proud to say that our efforts haven’t gone unnoticed – I was awarded the Riverland Women In Business Award in 2004, and was a finalist that year for the SA Telstra Business Women Awards. In 2015 we were finalists in two categories of the Australian Trust Awards for small business. And since mid 2011 we’ve published a bi-monthly mini-magazine called FARM GATE NEWS which we write, print and post to over 4000 farmers. It also includes useful hints, tips and ideas for farmers and country people, as well as a smattering of humour through jokes to make you laugh. And also our “Aussie Legends” section which showcases country people helping out in their communities and those who have invested in sheds from Grant Sheds. 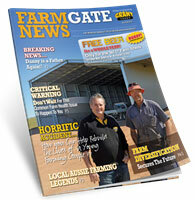 If you’re a farmer and would like to receive this FARM GATE NEWS bi-monthly magazine, I’ll give you a COMPLIMENTARY SUBSCRIPTION. Just go to this web page https://www.grantsheds.com.au/ and enter your details in the “Request Further Information” box on the right hand side. In the “How Can We Help” box, just type in that you’d like to receive our FARM GATE NEWS mini magazine and that you read about it in this blog. As it’s a printed publication that we send out by post, you will need to give your postal address when requested on the 2nd step of the request. I tell you about our awards and our farming community mini-magazine not to brag or boast in any way, but instead so you know a bit about our 63 year history, not just in supplying super strong, “Aussie Tough” farm sheds, but also to show you that we really do love to give back to our community and are proud of our caring, helpful and friendly attitude. You’re fully covered by our “Grant Sheds” Iron-Clad 50 Year Structural Guarantee! We’re yet to find any other shed company who will come within decades of our Guarantee period. Most are lucky just to offer you the standard material manufacturer’s warranty, if any. Some who use imported steel won’t even offer that. From our 6 decades in this business, we know that our sheds are built STRONG to stand the test of time. That’s why we’re so confident we can include this outrageous 50 Year Structural Guarantee when you choose a super strong ‘Aussie Tough’ shed from Grant Sheds. And you don’t even have to take our word for it – we have plenty of feedback from the ‘Farm Gates’ of other Aussie farmers about their own Grant Sheds experience. I hope we can add yours too one day soon! I’ve printed up a few of the many comments we’ve received from delighted Grant Sheds shed owners or you can check out what others say about Grant Sheds here https://www.grantsheds.com.au/what-others-say/ . You can even select your own area to see what people from your community are saying. The majority of sheds in our district are Grant sheds and you never hear a bad thing about them. I’ve seen other sheds brands that aren’t much cheaper and I’d have doubts that they’d last much longer than 5 years. The people at Grant Sheds are easty get along with and we felt very secure … you can just pick up the phone and nothing is too much trouble for them.